Nakusp, BC, Canada is located on the shores of Upper Arrow Lakes in the East Kootenays of British Columbia. This Kootenay region includes the village of Nakusp and the surrounding villages of New Denver, Malakwa, Halcyon, Summit Lake, Fauquier, Edgewood and Burton. We are excited to be here in Nakusp BC! 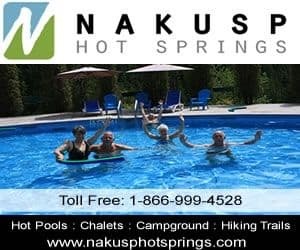 Activities most enjoyed in Nakusp and the surrounding areas include golfing, mountain biking, boating, sailing, fishing, kayaking, canoeing, swimming, camping, beachcombing, hot spring experiences and sledding ( snowmobiling ), xc skiing, and ice fishing. A few of the more popular activity and sightseeing park and trail destinations located in Nakusp, British Columbia and the surrounding areas includes the Nakusp Hot Springs, Waterfront Walkway, Box Lake Trail, Kimbol Lake Trail, Rosebery Provincial Park, Upper Arrow Lake, and the Summit Lake Provincial Park. The most visited sightseeing attractions, art galleries, historical sites and cultural venues in and around Nakusp, British Columbia include the Nakusp & District Museum, and art galleries. Travel services important to travelers in and around the community of Nakusp, BC includes accommodations (motel, vacation homes, cottages, resorts, lodges, bed and breakfast), guides, campgrounds, pubs, restaurants, gas stations, liquor stores, grocery store, coffee shops, cell service, internet, bank and transportation services including taxi, marina and bus. Explore Nakusp, British Columbia, Canada Travel Guide for Accommodations, Attractions and Adventure. eh! Plan to Visit Nakusp, BC, Canada today.